CDF, CMS, CLEO, MiniBooNE, MINERνA, CDMS, Solid Xenon, LIGO, LISA and ADMX. Since 1996, we have had 15 scientists and 12 students working on experiments at Fermilab. Construction and operation of a novel Cherenkov luminosity monitor detector for CDF, construction and operation of cathode strip chambers for the CMS endcap muon detectors, development of the CMS endcap muon L1 trigger, operation of a CMS Tier-2 computing site and development of strong high-performing computing facilities. Design and construction of a Xenon crystallization chamber for the Solid Xe experiment. Spokesperson in CDF, leadership roles in CDF’s exotics, top and quantum chromodynamics groups and CMS’s muon systems, trigger and Higgs group. Played key roles in CMS detector commissioning. Participate in CMS management boards. Helped lead MiniBooNE’s anti-neutrino mode analysis and MINERvA’s project management. Top quark physics, QCD, Higgs and searches for new physics in CDF and CMS. Our group played an important role in the Higgs discovery and is a leading contributor to the Higgs properties studies in H→ZZ→4l channel. Searching for non-standard neutrino oscillations and measuring neutrino cross sections at MiniBooNE and MINERvA. Searching for new charmed baryon states at CLEO and gravitational waves searches with LIGO and LISA. Dark matter searches including axions and WIMPs. WHAT SETS PARTICLE PHYSICS AT UNIVERSITY OF FLORIDA APART? The University of Florida has a very large high-energy physics experimental program. The group has broad experience in detector construction, computing, physics analysis and leadership positions in the experiments we participate on. We also have theorists that we collaborate closely with and some theorists who have joined some of the experiments we work on. All of these projects are part of the University of Florida’s Institute of High Energy Physics and Astrophysics (IHEPA). 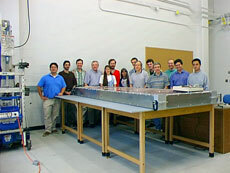 University of Florida physicists at the University's physics department experimental hall stand next to a test-ready CMS endcap muon cathode strip chamber.